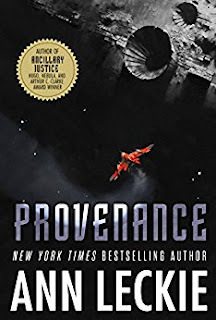 Provenance is Ann Leckie’s fourth novel. The first three (Ancillary Justice, Ancillary Sword, and Ancillary Mercy) make up a trilogy about an “ancillary” of the Imperial Radch who becomes involved in a conflict between two versions of the Emperor. This new novel is set in the same universe, at roughly the same time, but outside the Radch. It is engaging and fun but frankly seems just a little thin next to the Ancillary series. There’s no crime in that – I think it’s a good thing when an author reaches the point where her readers are glad to read each of her books, and are satisfied by them – but also admit that they are not each equally as good (or progressively better). Solid and enjoyable work is nothing to sneeze at. That said, if I’m saying that, it probably means I don’t consider Provenance one of the best five or six SF novels of the year – and that’s true. But it doesn’t disgrace the award by its nomination either – and, indeed, it fits with all the nominees I’ve read so far, in being enjoyable and entertaining but not exceptional. The main character is Ingray, a decidedly privileged young woman from the planet Hwae. Ingray’s mother Netano is a very powerful figure on Hwae, and Ingray has long believed that her brother Danach is her mother’s preferred heir. (In using terms like “young woman”, “mother”, “brother”, and “heir” I’m glossing over some interesting complexities of the social and gender organization on Hwae, including that people choose genders at roughly majority, that there are three choices (he, she, and e), that children (at least in powerful families) are often adopted), etc. etc.) So Ingray, in a desperate effort to impress Netano, has arranged to retrieve Pahlad Budraikim, the disgraced child of one of her mother’s rivals from “Compassionate Removal”, a ghastly seeming prison planet used by the Hwae in lieu of the death penalty. And now she has the person in question – except e claims to be someone else entirely. And Ingray is broke. So Ingray ends up, a bit fortuitously, with a trip back to Hwae on a ship captained by one Uisine. But that has its owned complications – in particular, Uisine is wanted for stealing his ship from the Geck. So the Geck want him, but technicalities allow Uisine to take Ingray back home. Uisine is guilty, with extenuating circumstances – he is one of a group of humans who live on the Gecks’ homeworld, but who must be adapted to their aquatic lifestyle. And his gills never came in. There’s a lot going on, and it’s pretty involving stuff. It’s mixed with worthwhile cultural details, varying from human group to human group, and complicated further when aliens are involved. There’s some believable and fun action. The characters are engaging. The exploration of gender roles on Hwae, intertwined interestingly with class, is nice (there are parallels with the way gender is chosen in J. Y. Yang’s Hugo-nominated novella “The Black Tides of Heaven”, and frankly I think Leckie’s depictions of gender selection more interesting than Yang’s). So, then, why did I say it sometimes seems a bit thin? One reason is that everyone seems basically an early 21st Century human, and lots of the background details of their lives don’t differ a lot from our lives. Other than that, the whole book, while remaining fun, does seem to work out a bit conveniently. It all adds up to a book I enjoyed plenty, but a book I that I don’t quite think stands among the very best novels of 2017.